Jinhua ham is one of the first Chinese traditional local foods that has successfully applied for a DOC status a number of years ago. Since then, only ham produced in the region of Jinhua (Zhejiang) is allowed to be marketed as Jinhua ham. One result of the increased status is that some companies have started using it as an ingredient to produce novel foods with a traditional local flavour. 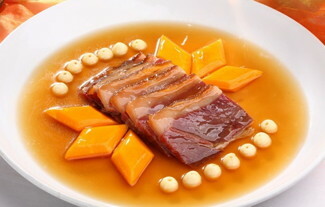 The Ham furu (fermented beancurd) of Lanting Food (Shaoxing) is a good example. The following picture shows how hams were produced in the traditional way. Jinhua is located slightly more to the south than the home regions of the other famous hams like parma and iberico. This is part of the reason for Jinhua ham’s unique flavour. The following video shows its modern production. It is in Chinese, but insiders should be able to understand most of it. A number of companies are cashing on that, but three companies claim to be producing the real stuff, based on there long history. This brand name was registered in 1919 by a Mr. Jiang of Dongyang. The hams made following his recipe were mainly produced in small workshops. The first factory was only established in 1979, by the fourth generation representative Jiang Youzhong. 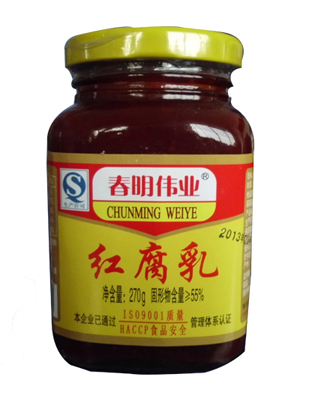 In 1997, the Dongyang government decided to increase the revenue from this famous local brand and, in cooperation with the regional Food Industry Association, assigned the right to use the Xuefangjiang brand to three manufacturers. However, by that time, China was trying to align its economy more with international practice and in this light it was deemed more appropriate to assign it to one single company: Xuefang Industrial & Commercial Co. Production is said to have increased considerably since then. 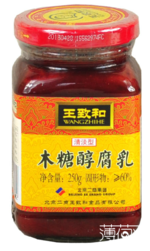 This variety of Jinhua ham has been developed by Fang Chengtong, who was born in Yongkang in 1875. He started his career as an apprentice of Xuefangjiang, but later developed his own recipe. His two sons continue their father’s business until they were hired by a local food company in 1954, as part of the economic reforms of that time. 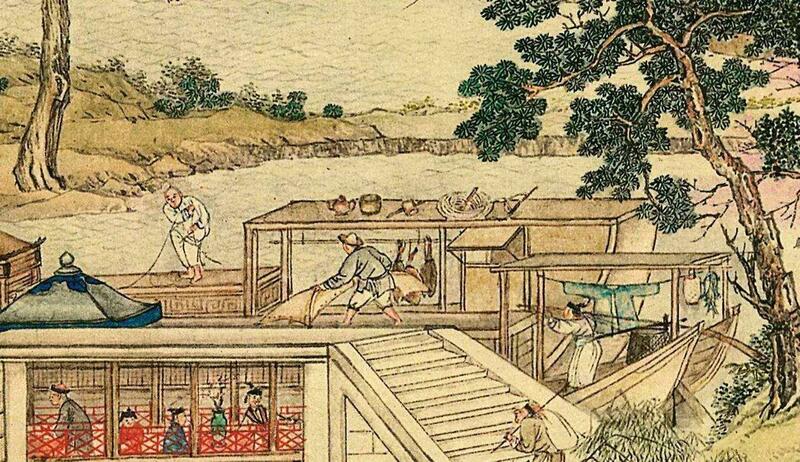 Fang Chengtong died in 1960 and his grandson, Fang Xiqian was initiated into ham making by his father Fang Fengxiu. When the provincial government decided to support the local ham industry, Fang Xiqian was put in charge of the technical management of a new ham factory established by the local government. He set up his own factory in 1990, for which he registered the Zhenfangzong brand in 2002. When his son Fang Jiangbo graduated from the Foreign Trade Dept of Shanghai Jiaotong University, he took over the management of the company. This tradition dates back to the 1930s, when Jin Shihui (of Jinhua descent) set up a ham workshop in Hangzhou, the capital of Zhejiang. He returned to his native city in 1947, where he continued his business. Jin led a merger of 4 ham workshops in Jinhua into one Jinlian Ham Sales Department in 1950. This privately operated company became part of a state owned enterprise in 1960, where it functioned as the Ham Workshop of the Jinhua Meat Factory. It was made a separate legal person again in 1979 and was reorganized into a limited company in 2000. 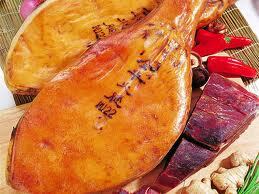 Because of its location in the core city of the Jinhua ham region, Jinhua brand ham is regarded as the most original. These are culturally rich stories, and they trigger an intriguing question: when will Jinhua ham take its legal position next to pata negra and Parma ham in the international showcase of great hams? With Jinhua ham developing so well, it is about time to start an international marketing campaign positioning it in the global market. The people in Jinhua need to hurry, as Spanish Ibérico ham is rapidly gaining popularity in China. In 2014, Fosun, one of China’s largest financial and industrial conglomerates, bought a stake in Osborne, in the parent company of Cinco Jotas, one of Spain’s top brands of Ibérico ham. Will Nestlé’s challenger be Chinese? Nestlé is still the world’s leading food company, but for how long? It is very active in China, but China’s own giant is occupying Nestlé’s markets too, one by one, step by step. The increasing Chinese appetite for high end foreign products is not a new issue. The economic problems in Europe and North America now seem to push China even faster in the position of top region for investment, and in both directions: inward and outward. The two giants, Beijing based COFCO (China Oils & Foodstuffs Corporation) and Bright from Shanghai, continue their race in acquiring foreign companies. Unlike many of their Western counterparts, they have the money to spend and they are the top food makers for more than 1.3 billion domestic consumers. COFCO claims to provide food products to one-fourth of the world’s population, around 1.8 billion customers. COFCO rose to the 121th position in the World Top 500 companies of 2016. COFCO’s revenue amounted to RMB 216.12 billion ($32 billion) in the first half of 2017, up 7% year-on-year. Its net profit in the same period also reached RMB 5.51 billion, surging 112% from the same period a year earlier. Moreover, while most Chinese overseas investors are constrained by lack of financing, COFCO has received large infusions of credit from Chinese policy banks. These include a RMB 30 bln line of credit from the Agricultural Development Bank of China for investment in grain-related projects in 2011; RMB 30 bln in financing over 5 years from the China Development Bank; and another commitment in 2016 from the Agricultural Development Bank to finance projects related to food security, food safety, and agricultural modernization. Simultaneously, we see multinationals like the two Colas, Nestlé, Unilever, etc., increase their stake in their respective Chinese markets. These corporations as well have no choice. If they do not invest now, there will not be enough of the pie left for them. Nestlé is very frank in admitting that it finds it harder than before to keep its market share in China, let alone increasing it. And in our current troubled world, losing market share in growing market like China equals losing market share worldwide. COFCO has become a genuine powerhouse. Following Donald Trump’s announcement about putting high import duties on imported steel and aluminium, COFCO’s President Patrick Yu alluded in an interview that he, as the world’s largest importer of soybeans, was able to harm the US by stopping to source that product from the US. Nestlé was one of the earliest multinational investors in China with an infant formula plant in Heilongjiang in the 1980s. The company is now active in the country with most of its product groups, like coffee, biscuits, or breakfast cereals. After 13 years of talks, Nestlé was formally invited into China in 1987 by the government of Heilongjiang province. Nestlé opened a plant to produce powdered milk and infant formula there in Acheng in 1990, but quickly realized that the local rail and road infrastructure was inadequate and inhibited the collection of milk and delivery of finished products. Rather than make do with the local infrastructure, Nestlé embarked on an ambitious plan to establish its own distribution network, known as milk roads, between 27 villages in the region and factory collection points, called chilling centers. Farmers brought their milk— often on bicycles or carts—to the centers where it was weighed and analyzed. Unlike the government, Nestlé paid the farmers promptly. Suddenly the farmers had an incentive to produce milk, and many bought a second cow, increasing the cow population in the district by 3000, to 9000, in 18 months. Area managers then organized a delivery system that used dedicated vans to deliver the milk to Nestlé’s factory. Although at first glance this might seem to be a very costly solution; Nestlé calculated that the long-term benefits would be substantial. Nestlé’s strategy is similar to that undertaken by many European and American companies during the first waves of industrialisation in those countries. Companies often had to invest in infrastructure that we now take for granted to get production off the ground. Once the infrastructure was in place in China, Nestlé’s production took off. In 1990, 316 mt of powdered milk and infant formula were produced. By 1994, output exceeded 10,000 mt, and the company decided to triple capacity. Based on this experience, Nestlé decided to build another two powdered milk factories in China and was aiming to generate sales of USD 700 million by 2000. Nestlé already operates three “milk districts” in China, in Shuangcheng (Heilongjiang), Laixi (Shandong) and Hulunbeier (Inner Mongolia). Nestlé has signed an agreement with a local government in north China’s Inner Mongolia region to build a 2,000 cow dairy farm in the area. The company says the farm will be “a transitional solution between small and individual farmers and a large modern farm”. Nestlé rarely invests in its own dairy production, preferring instead to develop supply chains with local farms or to import powdered milk on the global market. Its moves in China follow those of New Zealand’s Fonterra, the world’s largest milk producer and a major supplier of powdered milk to Nestlé. In China, Nestlé has collaborated with public and private organizations in opening breastfeeding rooms (the number was 3,297 mid 2019). This is an important expression of its global commitment to support breastfeeding, which it also protects by implementing a leading policy to market breast milk substitutes (BMS) responsibly. Since 2010, Nestlé has formed a bottled water venture with Yunnan Dashan Drinks Co. and bought controlling stakes in candy maker Hsu Fu Chi International and Yinlu Foods Group, producer of congee, saqima and a peanut-milk beverage. Through the alliances, Nestlé has tripled its China headcount to 47,000 employees. With 31 factories across the country, 90% of the products it sells in China are made there. Nestlé plans to build R&D centers at facilities owned by Hsu Fu Chi and Yinlu, where researchers will focus on ready-to- drink beverages and baked goods. The Swiss company already has a research center with Totole, a Chinese bouillon maker in Shanghai in which Nestlé has an 80% stake. Another facility in Beijing focuses on nutrition and food technology. Still, an intriguing thought for us to dwell upon every now and then is this: how many years are we away from the moment that Nestlé will start feeling competition from COFCO in Europe? For Nestlé, actually, this is not an issue to dwell upon, but to act on, by increasing its investment in COFCO’s home land. COFCO, formed through a series of mergers of state food and animal husbandry companies in the 1950s, has successfully transformed itself to a top national player in the food industry. E.g., COFCO controls 90% of China’s wheat imports. Nowadays, COFCO claims to provide food products to one-fourth of the world’s population, around 1.8 billion customers. COFCO plans to build new warehouses and processing facilities in countries including Myanmar, Kazakhstan, Ukraine and Indonesia to enhance its ability to acquire global food resources. COFCO has already purchased and built ports, logistics companies and storehouses in the world’s main grain-producing areas such as Australia, South America and the Black Sea region. Wan Zaotian, COFCO’s vice-president, said China has become the world’s largest market for food trade. Supported by the Belt and Road Initiative, food trade between China and its partners is expected to grow rapidly. It is critical for the group to build efficient global supply and logistics networks. In 2011, COFCO took control of Australian sugar producer Tully Sugar Ltd, but it lost a bid for Proserpine Cooperative Sugar Milling Association, another Australian company, in November of that year. In the wine sector, COFCO bought Chateau Viaud in Bordeaux, France, in February 2011 after investing USD 18 mln on a large swathe of Bisquertt, one of the Chile’s most upmarket brands in 2010. 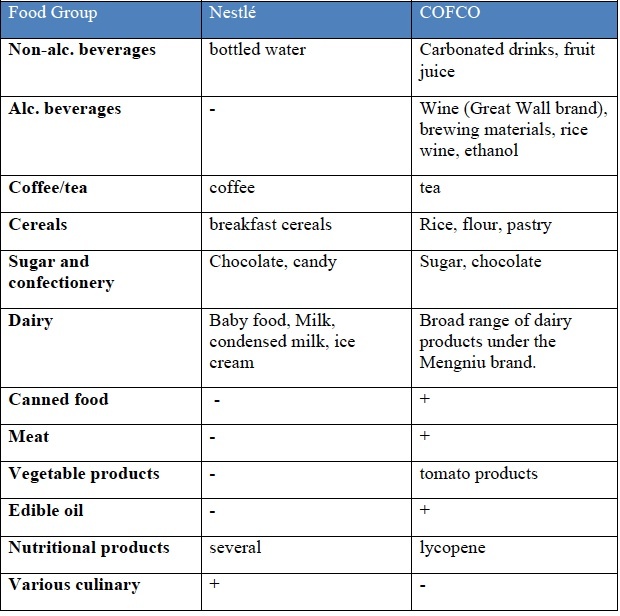 To put the competitive relationship between the world’s top food giant and China’s domestic one, I have compiled a simplified table of the major food groups and Nestlé and COFCO’s participation in each industry. 14/1/2014: COFCO is said to be on speaking terms with China’s second largest meat processor Jinluo Group to acquire the latter. 28/2/2014: COFCO to buy 51% of Dutch grain trader Nidera. The Nidera purchase gives Cofco a strong platform to produce grain in Brazil, Argentina and Central Europe. All regulatory approvals to close the transaction whereby an investment consortium led by COFCO, consisting of Hopu Investment, Temasek, IFC, Standard and Chartered Private Equity, has acquired 51% of Nidera have been obtained in October 2014. 4/3/2014: COFCO has acquired Noble’s agribusiness arm. With Noble’s agribusiness COFCO has gained grain elevators in Argentina and sugar mills in Brazil, as well as oilseed crushing plants in China, Ukraine and South Africa. 29/4/2014: COFCO is setting up a huge vegetable oil plant in the port city of Tianjin. 6/6/2014: COFCO Meat attracts a capital injection from a consortium of investors composed of KKR, Baring Private Equity Asia, HOPU, and Boyu. 8/10/2014: COFCO unveiled plans for an initial public offering (IPO), in a move that would allow it to compete with leading U.S. agribusinesses, according to several news reports. The planned IPO would include assets recently acquired Nidera and Noble. COFCO said its goal with the acquisitions was to connect large grain production areas, including those in South America and the Black Sea region to Asia. These investments are meant to will allow COFCO to compete with the traditional big-four trading houses from the west that are collectively known as ABCD: Archer Daniels Midland, Bunge Ltd, Cargill Inc and Louis Dreyfus Commodities BV as rising incomes drive up food demand in China. 10/11/2014: COFCO has signed an agreement with New Zealand Government-owned food safety firm AsureQuality and PricewaterhouseCoopers (PwC) to enhance the country’s food safety and quality. Oct. 2015: COFCO announces plans to construct two warehouses (100,000 MT capacity each) in Russia’s Mikhailovsky priority development territory in southern Primorsky Krai. 22/12/2015: Embattled commodities trader Noble Group has reached an agreement to sell its 49% stake in Noble Agri to COFCO International for $750 million. With this move, COFCO will pose an even bigger challenge to ABCD (see 8/10/2014 above). October 2016: COFCO signs an agreement with Australia’s Monash University. Under the deal, Monash University’s new Food Innovation Centre – and Australian food businesses – will now have access to the COFCO research arm’s resources, in-depth knowledge of Chinese consumers and regulatory expertise to fast-track supply opportunities for exporters. The university said the new centre would enable businesses to expand and target export markets, including China. 19/10/2016: Cofco Meat Holdings Ltd, a pork producer part-owned by KKR & Co, is seeking to raise as much as $333 million in a Hong Kong initial public offering. 8/11/2016: COFCO launches a power drink called Big Bang in cooperation with Refresco (Netherlands) to compete with Red Bull and similar beverages. May 2017: Loch Lomond Group, based in Alexandria in Scotland, has entered into a partnership with COFCO for the distribution in China of their whiskies, including Loch Lomond, Glen Scotia and Littlemill.According to the Scotch Whisky Association, the value of exports to China increased 0.5% to 41 million pounds in 2016. June 2017: DGB Pty Ltd, South Africa’s largest independent wine, spirits and craft beer producer, announces an exclusive distribution agreement with COFCO. COFCO will, in the initial phase, exclusively import DGB brands Boschendal and Tall Horse, with the expectation to later expand the portfolio with other brands from the DGB wine stable. 15/8/2017: COFCO partners with the Illinois-based farm cooperative Growmark Inc. they will jointly own and operate a truck, rail and barge terminal in Cahokia, Illinois, on the Mississippi River, the main pipeline that supplies exporters along the US Gulf Coast with corn and soybeans. The facility can receive about 180,000 bushels (4572.24 mt) of corn per hour, delivered by truck and rail, and can load two river barges simultaneously at a rate of about 60,000 bushels per hour. Feb. 2018: Cofco International Ltd., the trading arm of China’s largest food company, is building a soft commodities hub in Dubai. About 10 employees will trade sugar, coffee and cotton. Summer 2018: Cofco launches an energy drink of its own, jointly developed with Refresco (The Netherlands), marketed under the Big Bang brand. 8/5/2014: Nestlé announces intent to invest in coffee growing in Pu’er (Yunnan). 9/5/2014: fertiliser producer China Green Agriculture has entered a cooperation agreement with Nestlé (China) Co., Ltd. to jointly develop a direct sales program, as a mutual effort to supply the Company’s fertilizer products to coffee bean farmers in China. 16/6/2014: The University of Wisconsin-Madison, US, will develop the curriculum for a $400m Nestlé dairy training center in China. 17/6/2014: Nestlé has officially inaugurated its latest Chinese research and development facility in Dongguan (Guangdong). The R&D facility will support its partnership with Hsu Fu Chi and focus on research in confectionery and ice cream. 15/10/2014: Nestle opens China Dairy Farming Institute; Nestlé has inaugurated a “dairy farming institute” in Shuangcheng ( near Harbin, Heilongjiang) as part of ongoing efforts to foster the development of sustainable dairy production in the market in order to secure the supply of raw milk. The project involves an investment of CHF30 mln and is one of its biggest dairy investments in China. GEA Group will contribute its expertise to this institute. From February 2015 onwards, some 17 different courses about milking will be taught with direct involvement of the GEA Farm Technologies Academy. 20/11/2014: Nestlé Research Centre Beijing organizes a joint symposium with The 25th Great Wall International Congress of Cardiology (GW-ICC). The symposium focuses on nutritional approaches for cardiovascular and metabolic health. 8/5/2015: Nestlé China helps building a school in the earthquake stricken region of Sichuan. The company deftly combined the opening of the school with the “Food Safety Week into Campus” launched by the State Food and Drug Administration. 18/5/2015: Chinese Nutrition Society’s “12th National Nutritional Science Conference” was recently held in Beijing May 2015. Nestlé organized a “Start Healthy Stay Healthy” forum during the conference, inviting leading experts to deliver keynote speeches revolving around the latest developments in maternal and child nutrition research. 4/8/2015: Nestlé has invested RMB 50 mln in improving the cold storage facility of its ice cream plant in Guangzhou. The new installation is more environment friendly and will facilitate Nestlé serving the regional market better. 8/6/2016: Nestlé and Alibaba have launched a digital commerce and marketing campaign. It will feature 154 products from 30 brands, 67 of which will be introduced to Chinese consumers for the first time. 12/9/2016: National Institute of Nutrition and Health and Nestlé Research Center partner as sponsors for a symposium on nutrition and eating behaviours in Chinese children and adolescents. For the first time in China, findings from the Kids Nutrition and Health Study (KNHS) were presented at a national symposium held on September 11, 2016 in Xian. 29/12/2017: Nestlé announces plans to sell its dairy factory in Hulunbuir (Inner Mongolia), as part of the company’s efforts to reduce its local output of raw milk powder. 16/5/2018: Nestlé announces a partnership with technology company Xiaomi to support health through technology and explore digital nutrition. May 2018: Nestlé has finalised the move of its industrial milk powder production from Hulunbuir in Inner Mongolia to Saishang Dairy in Ningxia. Nov. 2018: Nestlé announces the first product developed by its incubator team in China which had been launched earlier in the year. Xingshan is a new brand of ready-to-drink herbal drinks and soups made with traditional Chinese ingredients, for busy urban professionals. 22/3/2019: Nestlé China unveils a new Research & Development center in Beijing and a system technology hub in Shenzhen to accelerate its trend-based innovation in China. Interestingly, in a recent article, a Chinese insider is wondering whether Dali Group will become the ‘Chinese Nestlé’. We will hold that thought and see.